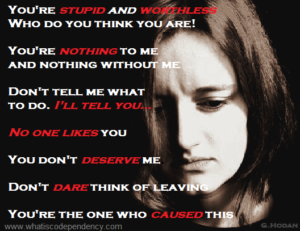 Do's and Don'ts in Confronting Abuse | What Is Codependency? Appeasement. Most victims try to placate an abuser to de-escalate conflict and anger. This tactic only empowers the abuser, who sees it as weakness and an opportunity to exert more control. Pleading sends the same message. Arguing. Verbal fights with an abuser lead to more resentment on both sides. As anger escalates, so does abuse. Nothing is gained. You lose and can end up feeling more victimized, hurt, and hopeless. Seeking understanding from the abuser. This is a futile objective, yet drives the behavior of victims who desperately want to be understood. They mistakenly believe or hope that the abuser is interested in understanding them, while the abuser is only interested in winning a conflict and having the superior position. Arguing over the facts is thus irrelevant. Most abusers aren’t interested in the facts, only justifying their position and being right. Criticizing. Because abusers are basically insecure, although they may act tough, inside they’re fragile. They can dish it, but can’t take it. Criticizing an abuser can provoke rage and vindictiveness. It’s more effective to be assertive and communicate your needs. There are effective ways to deal with abuse, although they aren’t our gut reaction. They require education and forethought. Here are positive steps you can take. Get information. Learn all you can about emotional abuse and codependency. People in abusive relationships tend to be codependent. Get Codependency for Dummies. Get support. Individual therapy, as well as attending 12-Step meetings, such as Al-Anon or CoDA, can be immensely helpful. If you’re being physically abused, get information about legal resources, hotlines, and shelters in your area, and read more tips. Raise your self-esteem. This will help you trust your reality, give your more options, and empower you to confront abuse. Begin by stopping any self-criticism, and then take action to rebuild your self-worth. Read 10 Steps to Self-Esteem-The Ultimate Guide to Stop Self-Criticism and watch the webinar How to Raise Your Self-Esteem. Become assertive. Learn to be assertive, rather than passive, placating, nagging, criticizing, or aggressive. Get How To Speak Your Mind―Become Assertive and Set Limits and the webinar How to Be Assertive. Be Strategic. If you’re dealing with someone highly defensive or with a personality disorder, there are specific strategies to having an impact. Read Dealing with a Narcissist: 8 Steps to Raise Self-Esteem and Set Boundaries with Difficult People.